Move debug/release changer to the combobox with run configurations. Update Chelper dependency to support Competitive companion extension. JHelper is plugin for writing contests in C++. You may inline code from your own prewritten library so that you can submit only used code. Besides, it allows to test on tests you've added. it's planned that you'll be able to parse a problem/contest and have all samples tests automatically added. Plugin is completely free. IDE price is 89$/year, but it's free for students, have 30-days free trial and often you can use EAP(smth like beta)-versions for free. Some explanations how to use that on wiki. Fell free to ask what is unclear. Please post bugs and feature requests here or in bug tracker. Implement something and create pull request. It's still possible to make it multilingual (I mean add another programming languages). I am open to discuss that. 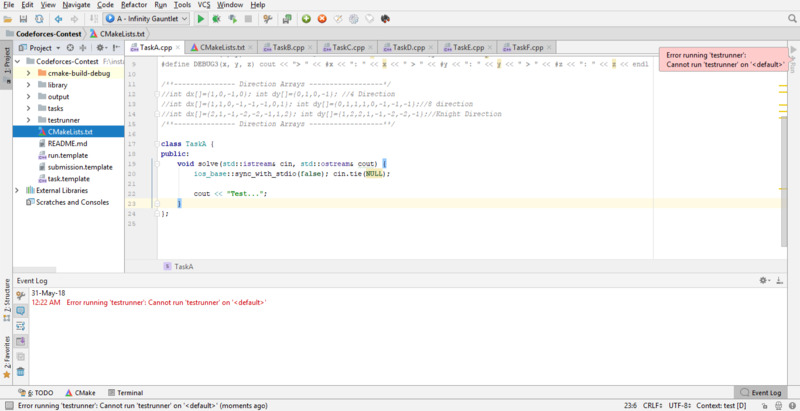 Thanks Egor for idea with his Chelper and abra for some code review. is there any documentation to know how to use it, please. Seems to be working now without any fix from me. I was testing and I got a problem, can you help me ? Did you create output configuration? See wiki for more details. Hello Alex, Thanks for making such a tool, and I am trying to set it up to use with CLion. I am having trouble setting up the plugin to generate the code. I have tried following the instructions on the wiki but unfortunately I do not fully understand them I think. I get the following error: Task file not found: Seems your task is in inconsistent state If you could provide any help it would be very much appreciated. Thanks again for the time you spent making this tool! Well, you need to create files that are in those boxes and add them in CMakeLists to appropriate configurations. Awesome thank you so much for quick response and help! I downloaded the repository and imported it as a new project and everything works now! Have been using java for all my contests so far with Chelper, but can't wait to now to get better at c++ and use it in contest too with your plugin. Again many thanks for your work! Also, just one more quick question if you don't mind. In Chelper there is archive button for tasks that one is done with. What is the best way of replicating that workflow in JHelper? Does one just create a folder and then drag the Task.cpp file and Task.task file there when you are done with problem? Thanks! Right, makes sense. Just out of curiosity how much work was it to get the plugin to the current state in terms of hours? At some point I would be interested in trying myself to port JHelper/CHelper to PyCharm for use with Python. I imagine it is a decent amount of work to get everything functional, yes? But I believe it will be easier to port my code to python then Java code to C++. 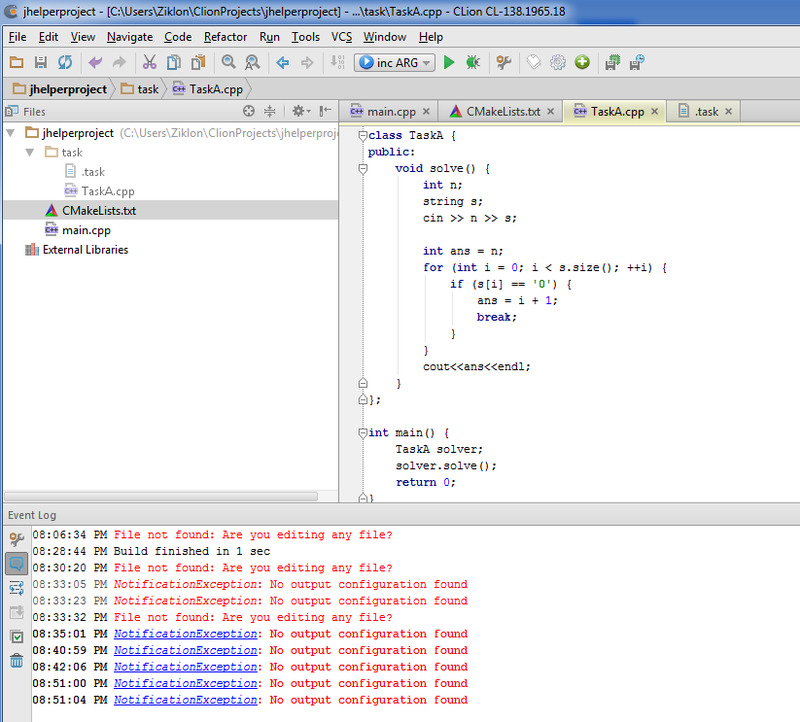 Added parsers from CHelper(currently only parser from IDE, not from Chrome) including CodeForces. For those who use other browsers (Firefox? ): it should be quite easy to write similar extension. Almost no logic is required. Can this be integrated with sublime too? Could you please give me some hints about how can I add a problem / contest, how to solve the problem (coding, testing and submitting) with JHelpr in Clion? I've study your wiki, but I need more obvious details! To add new task you need either use "Add Task" (manually add name and tests) action or Parse contest action (parse tests from Online judge). To make them available you should either add them on toolbar/menu or enable shortcuts for them. 1. Does Topcoder work with this? 2. What is the usual workflow? For every problem(or contest I parse), it tries to make it TaskA, so should I delete my TaskA every-time. 3. I keep getting many "IllegalArgumentException: childPath should be inside a parentPath", though nothing breaks. 4. Where to write stress-test code(like brute-force program and tester/generator)? 5. In GCJ contest, if I select multi-tests with number of tests known, how to get test case number? 6. Where to write pre-processing code, common to all test cases. Usually I just delete all tasks between contests. I'm going to do some sort of archivation, but it haven't been done yet. Could you post stack trace and say when it happens? Unfortunately there's currently no convenient way to do that. I'm open to your ideas. The first way is preferable because it will be called for each test (I mean for each test consisting of several test cases). 5. See 6, you should have testNumber var status either filled by ctor or static var. This error is on the left side. Other side has this error for every 5 seconds. I think I have sth wrong with run/debug configuration. Can you check it? Thanks. Let me know if you need any other details. Released support for local regex input type. Tested only on MacOS, should probably work on Linux. I've added several fixes, it seems to work now. Is there any way to disable the auto comment system? Recently when my programs print a lot or the testcase input is large, the program often terminates prematurely (but with exit code 0), only in the CLion (2017.2) run field, not in the Debug terminal... Did anyone else encounter this problem? Help Post, Why my solution was getting WA? Problem My Solution. Why WA Plz Help me. To Find Out Plz. Unfortunately last versions of CLion is not (yet) supported. The last supported version is 2017.2 Which version do you use? ok...thank you. I'm using the latest version 2018.1.3...About when would we get the latest version support? does it support clion 2017.2.3 ? is there any crome extensions for parse task?? i found chelper parse task crome extensions but it's not working for jhelper. installation don'e successfully, thanks for your great plugin. is there anyway to save tasks by folders ? each oj has its own folder. or task names become -> "ojName+taskName". can i do any of that? is there anyway to use scanf, and printf instead of in, out ? No ( at least no easy way ). Note that when you are testing, it's actually a stringstream. Just add sync_with_stdio(false) and cin.tie (nullptr) and forget about scanf as scary tail. i wrote a small math library in mymath.h and when i used some function i found all the functions written in output file(main.cpp). is there any way to just include the function i called ? There's setting that allow to remove unused code, but it doesn't work well, so I don't recommend it. You may place them in different headers and then only files you included will be added. yes i see eliminate code and reformat code, what does each one do exactly ? The first one is trying to eliminate unused code, but it has problems (code can become incorrect). The other is reformatting your code according to coding style configured in IDE (basically the same as clicking ctrl+alt+L. the problems with eliminate unused code -> are they because a certain way of coding that i may avoid while i write my code ?? Anyway if you want, you may try it, but be ready to turn it off when you get CE. Probability of having other problems (like getting wrong answer) is rather low. so the general tip here is no templates, yeah! Well, I don't think "not using templates like std::vector with custom types" is better tip than "not using option to eliminate code" but you may choose what fits you best. i have a lib that has func1, func2, func3, and i called only func3, but for some reasons that i don't know, i found that func1 and func3 are included in main.cpp but func2 aren't included although there is no call of func1 in func3. My code is pretty straightforward. It just finds all the functions that are unused in generated file according to what CLion reports. So, the most probable problem is that CLion shows some pace where it's used. You may try "find usages" IDE function in generated file to check place where it thinks it's used (because it should use the same mechanism). this is find usages in output file for bpow https://imgur.com/rAGJAyf usages only are in library and output and no usages in tasks folder !! i think i figured the problem. all recursive functions are included even if i didn't use them, and non recursive functions are removed. I'm ready to review your PR. Added some tips&tricks on configuring templates according to your needs. Server time: Apr/22/2019 12:08:32 (e2).